Find Your Cake! Get Ideas! 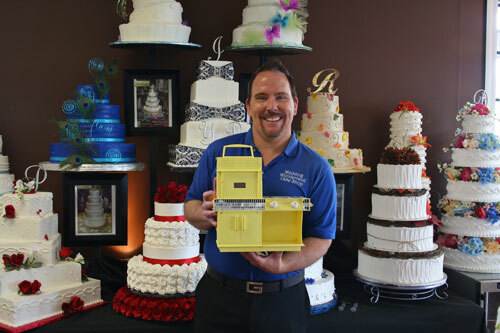 Wedding Wonderland Cakeshop owner, Michael Temm, holding his very first Easy Bake Oven. St. Louis’ Fondant Free Cake Bakery! Meet Michael Temm, owner of Wedding Wonderland Cakeshop in St. Louis, Missouri. Michael began dreaming of baking long before he received an Easy Bake Oven for Christmas when he was only six years old. His siblings and parents enjoyed his first delicious “Easy-Baked” delicacies and he’s been creating delectable masterpieces ever since. In 1995 Michael purchased Wedding Wonderland Cakeshop in Florissant, MO in the St. Louis area… that’s almost twenty years of baking up exquisite, delicious, unique cakes. Wedding Wonderland Cakeshop has been delighting St. Louis brides and grooms with amazing wedding cakes for two decades. We have the experience to make the wedding cake of YOUR DREAMS… any style you like… sleek & sophisticated, simple & elegant, trendy or whimsical, and of course traditional. But we’re not just for weddings. We can make the perfect cake for ANY occasion! We make it easy for you with an extensive online GALLERY OF CAKES and the largest cake showroom in St. Louis. Stop by and take a look at all of our display cakes, taste our samples, and tell us about the cake you’ve been dreaming about. The possibilities are endless. Our skillful “cake artists” will lovingly bake and hand decorate your dream into reality. Are you looking for one of those fancy 3D sculptured cakes you’ve seen on t.v.? We can do that too! Those are usually made with fondant cake icing which looks great but doesn’t taste so good. Our Wedding Wonderland cake chefs can create that fondant icing sculptured look using our delicious traditional butter cream icing. At Wedding Wonderland Cakes, you can truly get your cake AND eat it too! Our Wedding Wonderland “Cake Artists” having a little fun! One of these Things is Not Like the Others…. Work Hard and Play Hard! Time for Some Close Ups!! © Copyright 2018, Wedding Wonderland Cakes; All Rights Reserved. WINNERS TLC CAKE BOSS NEXT GREAT BAKER! website by Blue's ArtHouse Graphics & Web Design.